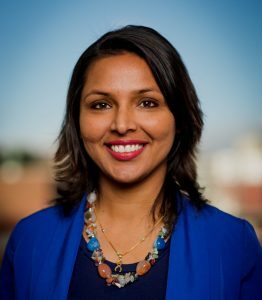 This installment features The City of Des Moines’ first equity coordinator, Manisha Paudel. Q: Let’s start by talking about your current role in Des Moines local government. I am the Equity Coordinator for City of Des Moines, and my position is housed within the Civil and Human Rights Department. It’s a brand new role for the City, and one of the first roles of its kind in the central Iowa region. Since the position is less than one year old, it’s still in its evolving stage. This position will partner with community members, organizational partners, and decision-makers to identify both barriers and loss of opportunities faced by Des Moines residents. The other side of my role is to provide training and information to all city staff so they are informed of the challenges. My goal is to ensure decisions result in equitable outcomes. When I was in college I didn’t intend on working in local government; I wanted to be a Human Rights Attorney working internationally. Prior to working in Des Moines, I worked with UNICEF in war-torn countries. When I came back to the United States, I felt compelled to be in a position where I would actually be able to make real changes from within the system. I did my masters in public service and stared working in Davenport, Iowa for the Parks and Recreation Department, where I noticed glaring inequities. The folks using the park services where all middle class and white. I worked to increase access for people of color, immigrants, LGBTQ, and disabled individuals. This experience led me to Dubuque ’s Human Rights Department in 2013. The human rights field was ideal for me. I was able to connect with different community groups and had an impact on changing practices within the government by implementing simple policies, such as translating public documents into different languages. Then, in 2015, a massive earthquake hit Nepal and I felt as though I needed to make a change. Dubuque just didn’t feel like enough. So I went to Tacoma, Washington to learn about how local government functioned in the Northwest. But eventually I moved back to Iowa to be closer to my family. I realized that you can go out and eliminate inequities, but you also have to practice the same ideals at home. That’s how I ended up here in Des Moines. Q: What inspired you to do pursue racial equity work? I am an immigrant, I am a person of color, and when I open my mouth, I sound different. Being that different person has always been very personal. I remember coming to the US and thinking, “Why is it that I am the “different” one in a country where everyone is different?” It was confusing. I’m originally from Nepal and I grew up in Canada. When I moved to the US from Canada, I had limited knowledge of US history, so I took courses in college to learn about how and why people were treated differently. I wanted to know why everyone in the White House, and in Washington D.C. all looked the same despite the diversity across the country. This curiosity drove me to better understand the racism and disparate treatment of African Americans, Native Americans, and people of color in the United States. I come from a country where there is a caste system; it was easy for me to understand why the hierarchical system was put in place and how the remnants have become normalized. To me, the vestiges of this history are personal. And professionally, I want to work to give people the choice to be happy. Happiness in human beings is something to strive for, and looking different is not a reason to be unhappy, or at least not have the opportunities to choose happiness. Q: How do you describe the concept of racial inequity to people who might not be familiar with what an Equity Officer is responsible for? I like to use metaphors; they really clarify things for me. I think of the United States as a swimming pool. In a pool, if you don’t know how to swim, you drown. People of color and poor whites were never taught how to swim; and before now, many were not even allowed near the swimming pool. Now, after the civil rights movement, people assume everything is equal and that everyone can swim or float, but that is not what’s happening. People are drowning. This is not because they don’t want to swim, it’s because they were never allowed to learn. Now we see local government stepping in to deal with all the people in society who are drowning, but many of the efforts are just bandages. They are more concerned with how to deal with the deaths, the aftermath. But for me, racial equity is not about tossing some folks a half-inflated waterwing, it is about teaching people how to swim so they can actually enjoy the pool. Q: With your perspective of having worked in multiple jurisdictions, have you seen any trends among racial equity efforts comparing Tacoma, Washington to the City of Des Moines, Iowa? I would say that they both face similar challenges. There are community members that still don’t have resources, access to resources, or even access to information about the resources. In all of the places I’ve been, it is almost identical. You could literally go around to different parts of each city and almost accurately identify areas that were historically redlined, and see this stark divide. Another important similarity is that all of these cities are intentional about doing the right thing – making sure that people who have historically been marginalized are receiving the deserved attention and resources they need. In Tacoma, all city departments utilize equity lens in their budgeting and decision-making. The City Council adopted Equity & Empowerment Framework to be implemented organization-wide. In Des Moines, we are in the process of getting there, and I’m very patient about that – better do it well than rush it. The City currently has a staff-led Equitable Services Team, with a goal to ensure ALL of our city service, practices, and policies are equitable. This means, we think more than once about who benefits and who continues to burden from the decisions we make. The need for instant gratification. We are human beings and we want to see results immediately, especially in America. It is difficult to justify these efforts today for results that may come 20 years down the road. When expectations from the community, government, and other stakeholders are stuck focusing on the short-term, it inhibits our ability to address the undercurrents of inequity. If clients and funders were really results focused, they would first look at what an equitable city looks like and work towards that. Unless you are able to answer that question, you are not realistically results oriented. On a similar note, this work requires a lot of justification. If I were to do this as a city engineer, or planner, you don’t need to justify the need for your position. Doing racial equity work, you need to explain who you are, why you’re doing this work, and you’re constantly in limbo about how you will be perceived. It’s a lot of pressure to constantly feel the need to prove value as an Equity Coordinator. The feeling of self-worth. I am happy every day to be doing this work because it is about potentially changing aspects of our society to make sure everyone can swim. It is rewarding to work towards a future where fewer and fewer people will drown. I really enjoy talking to folks in government and the community about inequity. I love the moment when people are made aware, when something finally clicks. These conversations also have had an impact on me. Because I look and sound different, I’ve always felt like I had to be a certain way to fit in. But in these contexts, the fact that I am different is not a bad thing. We focus so much on our intentions. We all say, “I intend to do this,” or “ I didn’t mean to do that.” It could be anyone in city government saying these things on any given day. Because we focus so much on our intentions, what we mean to do, it becomes too much about us as decision makers, our egos and reputations, as opposed to the results. I also think that there is a lack of vision. We are not talking about long-term results or why this is an issue that to be addressed well into our future; we are undoing over 400 years of history! Hopefully it doesn’t take 400 years to address, but it could. Unfortunately, people expect instant results. We need more training on equity so that we can understand that simply enacting a new policy or law will not necessarily change hearts, minds, and behaviors. Q: How can we overcome these barriers and make greatest strides toward a more equitable society over the next 10 years? One thing that I will say – there are a lot of people doing equity work. The existence of positions like mine means that there’s hope for change. These government positions, however, need a lot more decision-making power. That’s a message to local officials and executives to recognize that the people in these positions will have to challenge them. In order to do that, these positions need to have a certain level of decision-making authority. It’s difficult to be results focused when the results might sit well with the current decision makers. Equity-focused positions are the only positions trying to flip the house in terms of practices and policies. There is no other role within government like this, and I don’t want to be fired! Making society more equitable is not like fixing potholes. Sometimes the results are not expected or known when we set out to solve a problem. This work is new and we need the trust and authority to go out and make our communities more equitable for everyone.